One of the hardest parts of selling your home isn’t marketing, honing in on the right price or even finding a buyer. Nope! It’s keeping the place neat and tidy. As you’re likely in the midst of moving yourself, your home’s probably littered with boxes, bags and packing supplies. Throw in your kids, pets and messy spouse, and keeping the clutter at bay may seem like a hopeless cause. Unfortunately, it’s non-negotiable if you want to sell your house. Clutter not only makes a home look dirty and uncared for (therefore worth less money! ), but it also make it hard for buyers to envision themselves in a property – something vital to the home buying process. Designate a last-minute clutter hideaway. Have a catch-all storage bin located somewhere in a cabinet or closet where buyers are unlikely to look. Then, when a last-minute showing comes up, take a quick pass through your home and gather anything that’s out of place or you don’t have time to sort at the moment. Stick it in your hideaway, and once the showing is over, put it all back in its rightful place. Declare off-limits areas. 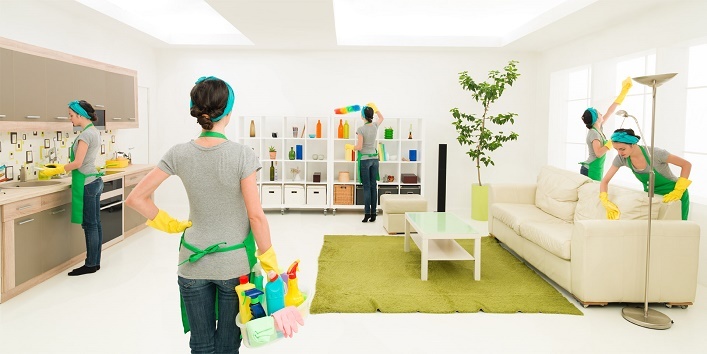 The less activity a room sees, the easier it is to keep it clean and clutter-free. While you probably can’t declare your kitchen or bedrooms a no-go zone while you sell, consider swearing off your dining room, guest rooms, study area and other spaces in the home you don’t use as much. If you have little ones, you can even put up a baby gate to make sure they stay out. Enforce the one-touch rule. No more putting things down only to pick them up later. Instead, enforce the one-touch rule that says you use only one touch to take an item from where it is to where it’s supposed to be. An example? You come in from the pool and put your towel on the counter. Later, after the kids go to sleep, you put the towel on the drying rack in your utility room. That’s a two-touch process. To keep clutter at bay, take that towel directly to its final resting place on the first try – and cut out the extra step. Have a pre-showing checklist. Before you leave the home to make room for a showing, run through a quick checklist of must-dos. It should include things like: flushing the toilet, kenneling your cats and dogs, emptying any trash cans, empty the sink, turning off the alarm, opening all the doors, etc. Put it all on a Post-It note on your fridge or by your keys so you won’t forget. Are you considering putting your home on the market? Want to ensure it sells quickly, easily and at a great price? Contact The Claus Team today. We’re here to help every step of the way.